Jalapeños and pimentos are the stars of the show in my twist on this classic comfort food dish. 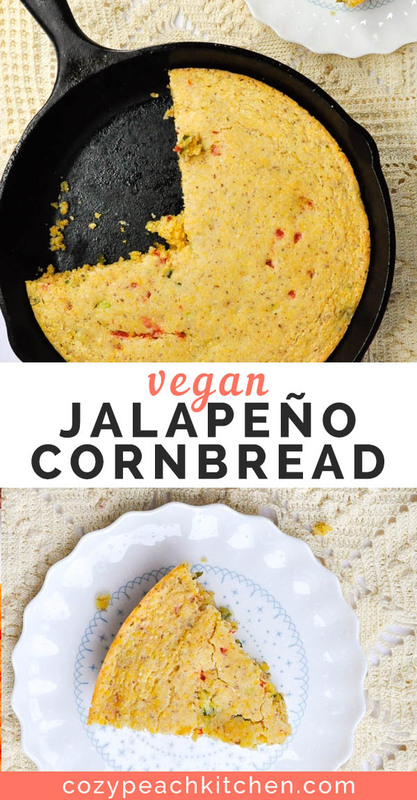 Why make a vegan jalapeño cornbread…with pimentos? I recently realized that I’ve never had pimentos in anything other than pimento cheese and olives. What better way to pay tribute to my favorite Southern fare than by combining two of my great loves: pimento cheese (minus the cheese) and jalapeño cornbread. A star is born! 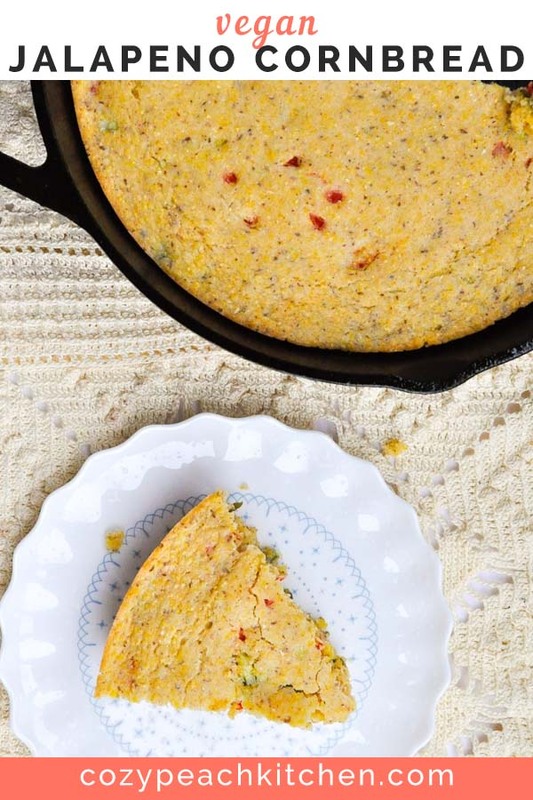 This cornbread is made with medium ground cornmeal, making it a touch healthier than its classic counterpart, because it retains some of the hull that fine ground cornmeal loses. 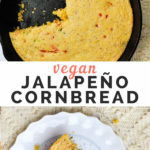 How do I make vegan cornbread? I leave out the buttermilk and mix soy milk (or any other non-dairy milk) with 1 tablespoon of vinegar to make a vegan version that’s lower in fat but otherwise gives the same result. The vinegar adds a slight tang-y flavor like dairy buttermilk does. It also curdles the milk a bit, which makes it slightly thicker. Although butter is the traditional way to make cornbread, I’ve always used oil. 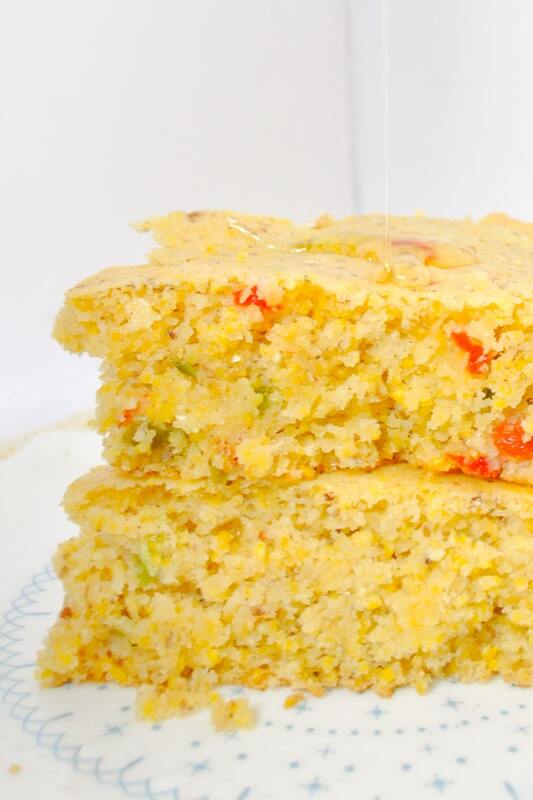 I grew up on cornbread mixes (think Jiffy Cornbread mix – the best!! ), and my mom always used canola or vegetable oil in it. Without butter, the final texture is still moist & crumbly as can be! 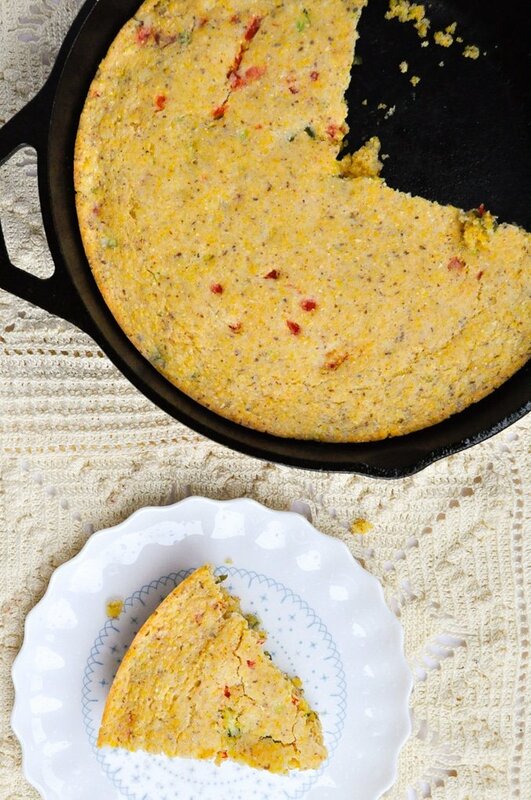 And if you’ve made it this far and you’re still not convinced, this spicy pepper cornbread is not that spicy. The jalapeños turn much sweeter as they bake- they really only retain a bit of their initial spiciness. 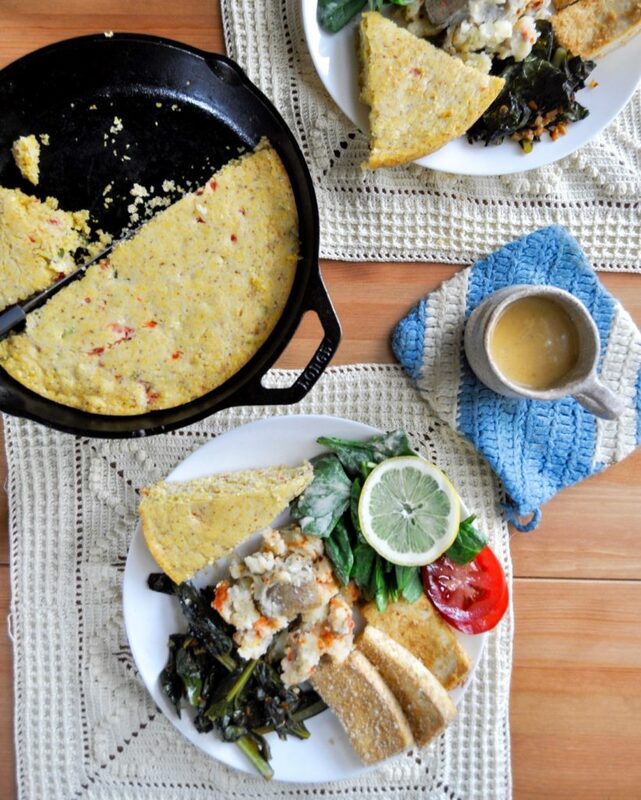 Pair vegan jalapeño pimento cornbread with the cozy peach comfort bowl for a delicious feast of flavors, or keep things simple with slow cooker chipotle black bean soup. The photo above is of a delicious brunch I made the other day. It includes a few components from my cozy peach comfort bowl (savory breaded tofu, garlicky greens) and a few other favorites, like pimento mashed potatoes and a fresh spinach salad. “Why southern cornbread shouldn’t have sugar” aka my tastebuds aren’t a fan of no sugar in my cornbread, so instead of following through with it on my recipe, just read about it. To elaborate on the above point, sweet vs. non-sweet is a big talking point that I didn’t know about until delving into cornbread history. FYI I grew up eating Jiffy cornbread mix in Illinois, so I’m not sure where I fall into this argument. 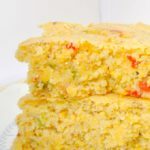 Jalapeño Pimento Cornbread is the perfect balance of sweet and spicy vegan comfort food, and it's on the table in less than 35 minutes. Preheat oven to 375° F. Make your flax egg by combining flax and water. Let sit for at least five minutes before using. Stir together soy milk and apple cider vinegar and let sit for at least 10 minutes before using. Combine dry ingredients in a medium mixing bowl: flour, cornmeal, sugar, baking powder, baking soda, salt. Pour all remaining ingredients, except peppers, into dry ingredients. Stir until just combined. Fold in jalapeños and pimentos. 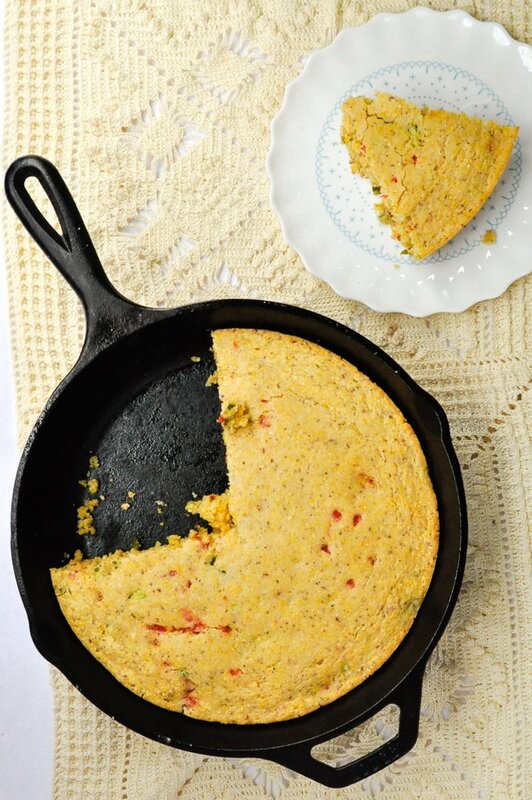 Pour cornbread batter into a well oiled medium cast iron skillet. Baking at 375°F for 25-30 minutes, or until a knife inserted in the center comes out clean. It's preferable to make cornbread in a preheated cast iron skillet. Place your medium sized cast iron skilled in the oven while it's preheating, then add your batter when the oven is heated. This yields nice and crispy cornbread edges. *Not all white sugar is vegan. If you follow a vegan diet, make sure to choose a white sugar that has vegan on the label.